This paper contributes to the literature on the detection of structural breaks in the mean and variance of Malaysian Shariah compliant stock indices (FTSE Emas Shariah and FTSE Hijrah Shariah) and their main index, FTSE Bursa Malaysia KLCI. The existence of structural changes in mean is tested using the Bai and Perron procedure. On the other hands, we use Inclan and Tio (1999) Iterated Cumulative Sums of Squares (IT-ICSS) algorithm and Sansó et al. (2004) modified ICSS algorithm procedures to identify any structural changes in series variance. Based on the Bai and Perron test results, there is no structural break reported in Shariah compliant indices. However, the structural breaks in Shariah compliant indices are only reported in the variance of the data series. This study also provides some possible explanations for the cause of these structural shifts in both mean and variance. 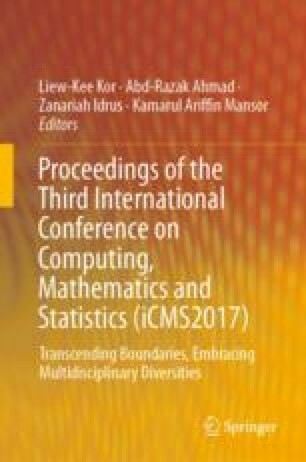 The authors would like to extend their sincere gratitude to the Ministry of Higher Education Malaysia (MOHE) for the financial supports received for this work under FRGS grant (203/PMATHS/6711604).